The view discussed below, looking over Little Yosemite Valley towards Cascade Cliffs in late afternoon light. Note the glacier erratic (big rock) to the left. 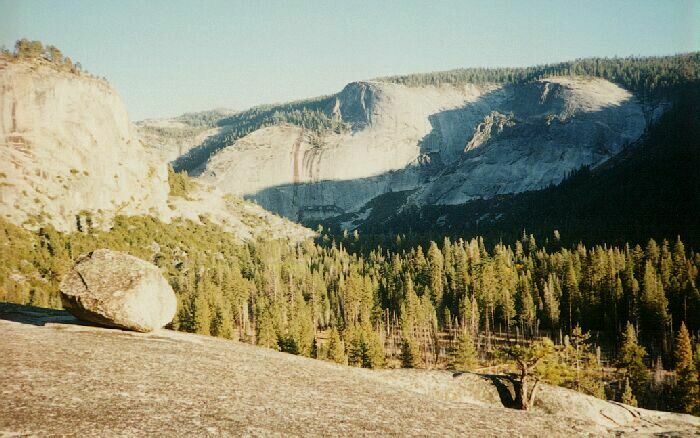 The Little Yosemite Valley campground is probably the most visited camp in the designated wilderness. One of the fun things to do at that camp towards sundown is to take the Half Dome trail towards Half Dome and hike to about 6341 feet where you will see to the right the top of a dome across a small easily traversed gully. That wide open white granite dome has a great view of the valley and is a good spot for watching the evening alpine-glow. After dinner and chores, I grabbed my chair and headed to one of the common fire pits to visit with some new friends I had met that day and make some new friends. I had treated huge foot blisters on one hiker and gave some hopefully useful advice for Sierra hiking footwear. My opinion, after wearing out numerous pairs of hiking boots and collecting my fair share of blisters, it that for trail hiking in the Sierra in peak or near peak hiking season, most people are best off with waterproof (high or low top) trail-runner shoes that have a more tennis-shoe like feel to them. Some people may need more ankle or arch support (and some trail runners can do a fair job of that), but most Sierra trails just do not require heavy boots to walk them. Heavy cross-country mountaineering is another matter and call for sturdy boots. I happened to be wearing some very comfortable well-broken-in boots because I was expecting some cold nights at least, and they kept my feet warm. I also collected a few blisters due to the long miles that even trail-runner shoes may not have avoided. Early and late season calls for waterproof and warm trail-runners or boots. Just remember, if the shoe is not comfortable when you are trying them on in the store, they sure as heck will not be comfortable on the trail! Breaking in footwear is a thing of the past. All footwear should be as comfortable or nearly so as your street shoes from the moment you try them on. 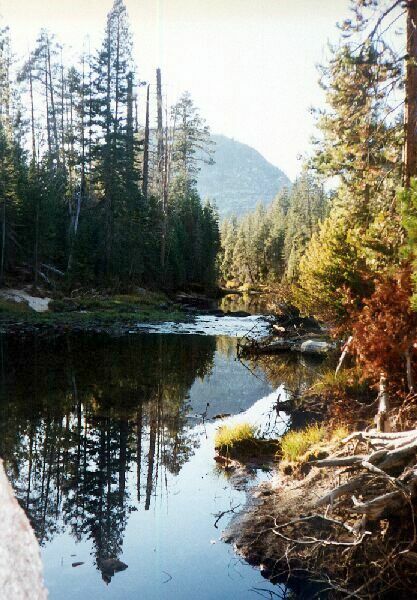 The view down the Merced River from near camp, looking towards Liberty Cap. I spent several hours chatting around the common fire and swapping stories, a pleasant social gathering. One fellow from Japan who spoke broken English, boiled water in the fire for his rice and miso soup. Eventually the fire died down and we headed back to our camps. It was interesting finding my camp, which was on the opposite side of the now totally dark camp. I overshot by one camp, but found my bivy-tent and dove in. The night started out mild but got down to freezing cold during the night. I worried about my inexperienced neighbors. I slept warm.